30 TIMES MORE ANTIOXIDANTS! 30 TIMES MORE EFFECTIVE TO PROTECT YOUR HEART! 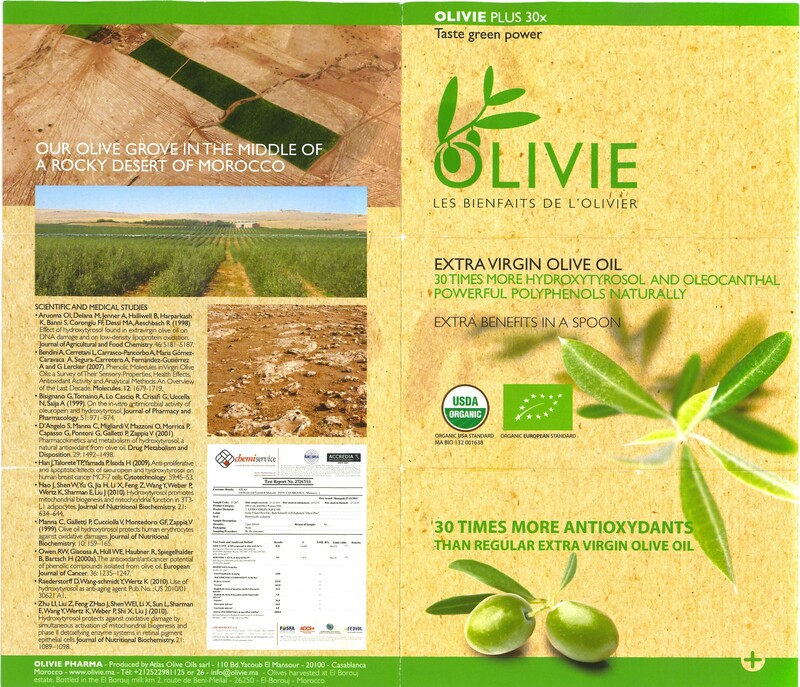 OLIVIE PLUS 30X Extra Virgin Olive Oil has been produced since 1887 by Atlas Olive Oils, located in El-Borouj, Morocco. The company is experienced for 125 years in producing high quality extra virgin olive oil, making Atlas Olive Oils among the very best olive oil producers in the world, gaining a lot of international recognition. Among the recognition received is the Mario Solinas Award organised by the International Olive Oil Council, the 'Great Taste Award of London' and The International Olive Oil Competition of Los Angeles in the United States. Why is Olivie Plus 30x SPECIAL & UNIQUE? The hot, dry and rocky Atlas Olive Oils olive oil field is ideal for producing high quality olives. A total of three million olive trees are planted in an estate of 600 hectares. The high polyphenol density in OLIVIE PLUS 30X is a result of the unique environment where the olive tree grows. The wilderness environment, rocky soil and water scarcity have forced the olive tree to produce high-yielding fruit that contains high levels of antioxidant properties, resulting from its own instinct of survival. The olives are planted in desert areas where the soil and its surroundings are free from pollution. The processing of OLIVIE PLUS 30X Olive Oil is made at the processing plant located within the plantation as soon as fresh olives are extracted from the olive oil fields. 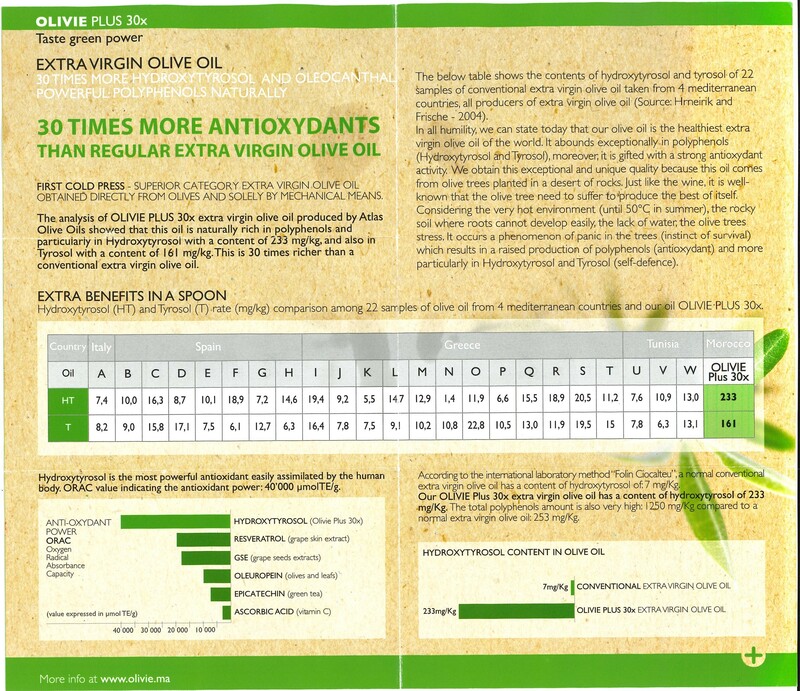 The analysis of OLIVIE PLUS 30X extra virgin olive oil produced by Atlas Olive Oils showed that this oil is naturally rich in polyphenols and particularly in Hydroxytyrosol with content of 233 mg/kg, and also in Tyrosol with content of 161 mg/kg. The ORGANIC CERTIFICATE OF THE USFDA (United States Food and Drug Administration) is an important recognition of an internationally renowned body, certifying that the OLIVIE PLUS 30X is an organic food product that is free of chemicals and pollutants. The test report on OLIVIE PLUS 30X product shows that the product is rich in antioxidants and 100% natural. One spoon of OLIVIE PLUS 30X gives 30x benefits compared to the usual extra virgin olive oil proven from scientific research. Analysis also shows that OLIVIE PLUS 30X produced by Atlas Olive Oils has a rich content of natural polyphenols (polyphenols) and specifically Hydroxytyrosol which has 30 times more than regular extra virgin olive oil. The resulting polyphenol content is important to protect the cells in the body from oxidative damage to prevent serious diseases such as cancer, heart disease, Parkinson and so on. Hydroxytyrosol is the smallest and unique antioxidant molecule capable of crossing cell membranes and the blood-brain barrier. Hydroxytyrosol content in Olivie Plus 30x is 25 to 30 times higher than regular olive oil. This can be seen with the comparison chart. There are two main components in OLIVIE PLUS 30X namely Hydroxytyrosol and Polyphenols. These two contents distinguish OLIVIE PLUS 30X from other olive oils. Hydroxytyrosol is the most powerful antioxidant "superstar" that has been found to date. Oxygen Radical Absorbance Capacity (ORAC) value is recorded as high as 68,567 which is 15 times higher than green tea. ORAC measures how well the substance or product tested protects the vulnerable molecules from oxidation by the free radicals - the less free radical damage there is, the higher the antioxidant capacity of the substance. Professor Henri Joyeux, an international nutritional expert and cancer surgeon from Montpellier University Hospital in France said, "I will use OLIVIE PLUS 30X widely without prescription, especially in my role as oncologist." Professor Henri Joyeux, known as “the world's father of cancer” was also involved in publishing a book titled “Olive Oil Antioxydants - A Treasure For Your Health”. This book is a scientific study of chronic diseases and the function of OLIVIE PLUS 30X olive oil in helping to prevent and treat cancer.